The EXP 9F concept, pictured at the Beijing show, is a balance between 'Shanghai limousine luxury' and 'British utility,' Bentley says. 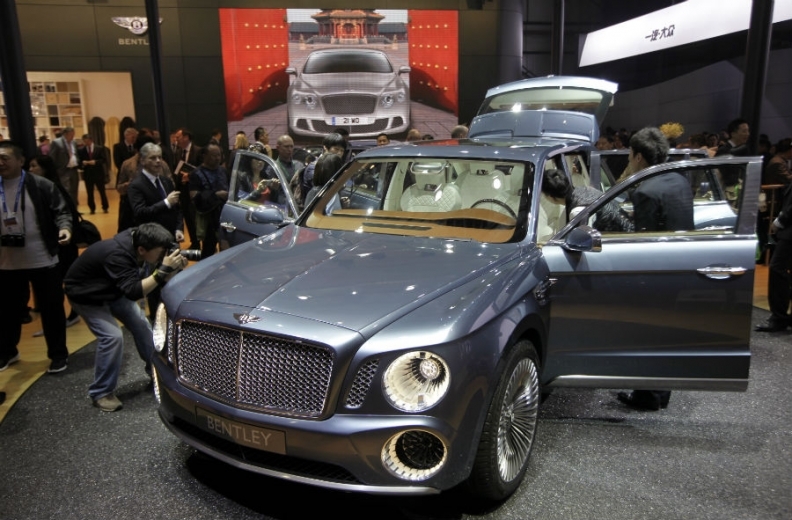 SHANGHAI (Bloomberg) -- Bentley aims to sell 3,000 units of its planned SUV annually when production starts in 2015. Bentley CEO Wolfgang Duerheimer gave the sales target in an interview at the Beijing auto show. He said the brand is confident of getting approval to build the SUV from parent Volkswagen by year-end. The UK-based ultraluxury brand previewed the SUV with the EXP 9F concept unveiled at the Geneva auto show in March. In Beijing, the automaker showcased a silver-blue concept model and gave powertrain details for the first time. The company said a range of advanced powertrains is under consideration for the production car including a 500-hp, 4.0-liter V-8 Twin turbo, a V-6 plug-in hybrid, in addition to a flagship 6.0-liter W-12 engine. With a potential 30km range in full electric mode and CO2 emissions of 130g/km, the V-6 hybrid would be capable of a 0 to 100kph sprint time of less than 5 seconds, Bentley said. Bentley sold 37 percent more cars in 2011 as demand for the automaker's models doubled in China, helping make the brand profitable for the first time since 2008. "At present, we are working out our internal Bentley business case and it looks very optimistic," said Duerheimer, who expects to price the SUV from 160,000 euros ($210,000) to 200,000 euros, or higher than any other SUV available on the market now. The maker of the Continental GT luxury coupe said it is aiming to sell the SUV in "developed SUV markets" such as the United States, the UK and China. Chinese customer preferences were a consideration in the styling of the vehicle, said Robin Page, Bentley's head of interior design. China overtook the United States to become the biggest sales market for the brand in the first quarter, with 547 cars sold. "The concept was a balance between what we called 'Shanghai limousine luxury' and 'British utility'," Page said in Beijing, gesturing to the soft, white leather finishing, silk-wool rugs and rear seats designed for a chauffeur-driven customer in mind. Bentley's design team had come up with six different ideas for the model, with one extreme being a picture of a Chinese businessman seated in the back of a limousine, and at the other extreme, an Englishman with a picnic mat spread around his car, he said. Picnic sets of silver cutlery, glasses and square white plates were included in the trunk to highlight the utilitarian aspect of the car, Page said. Bentley opened its 19th showroom in China, and largest worldwide, in Beijing on April 21, and plans to open four more by the end of the year, said Chong Got, executive director of Bentley China. The new dealers will be focused in cities outside Shanghai, Beijing and Tianjin, Durheimer said. "We are looking inland," he said. "We know what the people do, we know how they earn their money and we know how rich they are. It would be a mistake to neglect some major cities which have a population of more than 1 million inhabitants."